Patrick Walsh and Eli Wenger are passionate about their jobs and quick to say that, in a perfect world, they would be unnecessary. “This is not the ideal way to address the fact that we have immense inequality in our world,” said Walsh, who manages Martha’s Choice Marketplace, the largest food pantry in Montgomery County. More than 900 families each month are served by the market, which is operated by archdiocesan Catholic Social Services (CSS) at its Montgomery County Family Service Center in Norristown, on the campus of St. Paul Parish (353 East Johnson Highway), one of five CSS sites throughout the Philadelphia area. The outreach’s name recalls Martha, the sister of Mary and Lazarus, whom Scripture describes as providing hospitality to Jesus (Luke 10:38-42, John 12:2). The pantry distributes anywhere from 55,000 to 75,000 pounds of food per month, averaging 850,000 pounds per year. Clients must reside in Montgomery County and satisfy the requirements of the federally funded emergency assistance food program in Pennsylvania (TEFAP). In addition to its core financing from Catholic Social Services, the market receives major support from an array of organizations, including archdiocesan Nutritional Development Services, the Knights of Columbus, the Order of Malta and the Boy Scouts, as well as area colleges, businesses and archdiocesan parishes. Approximately 500 volunteers round out the pantry’s resources. Nutrition is prioritized at the market, since studies have shown that health issues such as diabetes and heart disease tend to disproportionately affect those at lower-income levels. Shortly before Christmas, a local advertising agency offered to donate 10,000 pounds of food and asked the market’s staff for their preferred staples. Walsh and assistant manager Wenger listed several, including quinoa, farro, dried beans and peanut butter without partially hydrogenated oil. The market also provides refrigerated and frozen items, thanks to storage equipment secured by the Order of Malta. According to Walsh and Wenger, the market has existed in some form for the past 15 years. In 2015, CSS converted the outreach into a choice pantry, where clients select the actual foods they need and want, rather than simply receive a prepackaged assortment of staples. Equally important is the way in which the shopping experience affirms the dignity of each client. “It eliminates some of the barrier between the served and the server, and the power dynamics that come with that,” said Wenger. 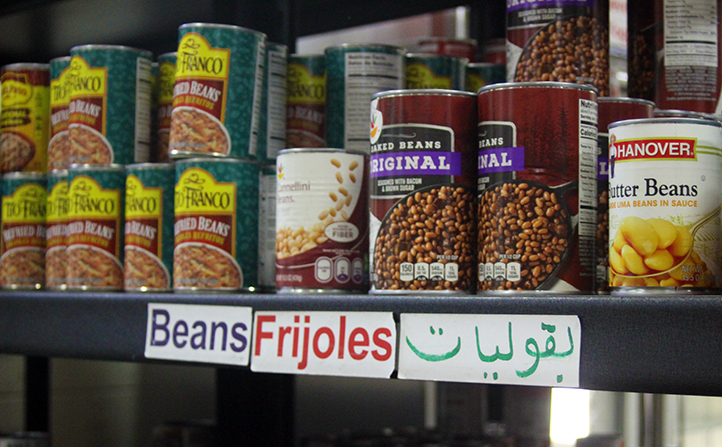 Items are displayed as in a retail supermarket, and clearly labeled in three languages: English, Spanish and Arabic. “We have a large Coptic Christian population from Egypt now living in Montgomery County,” said Walsh, while Wenger noted that several other clients are Muslim. Volunteers assisted with the sign translations, since no one currently on staff is fluent in Arabic. The welcoming atmosphere enables clients to trust the staff at the market and at CSS’s family service center, which provides access to benefits, housing assistance, employment training, afterschool care, pregnancy and parenting classes, and senior support. The market therefore acts a portal to CSS and to “positive relationships that are cross-class, cross-cultural and cross-generational,” said Walsh. Renewing a sense of community is essential to addressing the true causes of food insecurity, Wenger said. Clients often become active volunteers, developing confidence and business skills while increasing the market’s efficiency. One of the more surprising outcomes of Martha’s Choice is its ability to unite diverse volunteers — from “diehard social justice warriors to diehard Trump supporters” — for a common good. “If you put them together in any other room, there would be a fight, or at least an argument,” said Wenger. “But here, they’re part of a family,” Walsh added. Both Walsh and Wenger believe much more needs to be done to untangle the complex roots of food insecurity and poverty. Crucial to these efforts, they said, is raising the minimum wage, which in Pennsylvania currently stands at $7.25 an hour. “All the surrounding states have raised it, but we have not,” said Walsh. “You’re making $7.25 an hour, and you’re working one, two, three jobs, and you still can’t make ends meet,” he said. According to MIT’s living wage calculator, a living wage for a single adult in Montgomery County is currently $12.17 per hour, and $24.90 for one adult and one child. Ultimately, Walsh and Wenger see Martha’s Choice as a means of meeting a need greater than physical hunger.